One of my fondest memories of growing up in the States is of my regular weekend bagel runs with my dad. In the summer we'd wake up early and ride our bikes into town to pick up a dozen mixed and a couple tubs of cream cheese. We'd then speed back home to dole out the goods to my mom and sisters, basking in their admiration of these 'bringers of breakfast'. I'd never get tired of trying new combinations of bagels and cream cheese flavours (though my go-to was always chocolate chip bagel with chives and onion cream cheese...I swear it really, really worked). 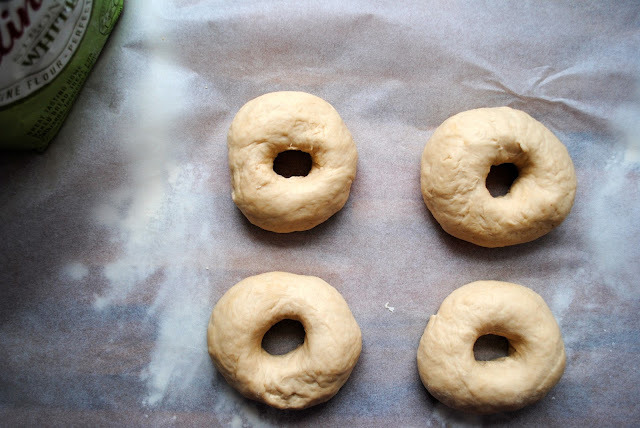 To make about eight bagels start by pouring 1 1/2 teaspoons of fast action yeast and 1 1/2 tablespoons of granulated sugar into half a cup of warm water. Leave it for a few minutes and then stir until the sugar and yeast has dissolved. This was a recipe I desperately wanted to go well for two reasons. One being that I'd tried it once before and it was an unmitigated disaster. The second was that I was hungry, and there was no other food in the flat. Mix 3 1/2 cups of flour with 1 1/2 teaspoons of salt and sift into a large mixing bowl. Create a well in the centre and pour in the yeast mix. Have another cup or so of warm water to hand and add in bit by bit as you mix it all together - go in with your hands here buddy. Once you've added - not including the yeast mixture - about another cup of water, the mixture should come together nicely. Tip the dough onto a floured work surface and knead for ten minutes until you've got a nice smooth, elastic dough. Roll into a ball and stick in a pre-oiled bowl, rolling around to oil the dough slightly. Cover with a damp tea towel and stick in a warm place for an hour. Coming home from town with our bag of goodies, we'd have all kinds of bagels. There was cheese flavoured, sun-dried tomato, cinnamon brown sugar...even a strange wholemeal and oats one that was usually the last of the dozen that was left standing. One of my favourites was always the everything bagel. 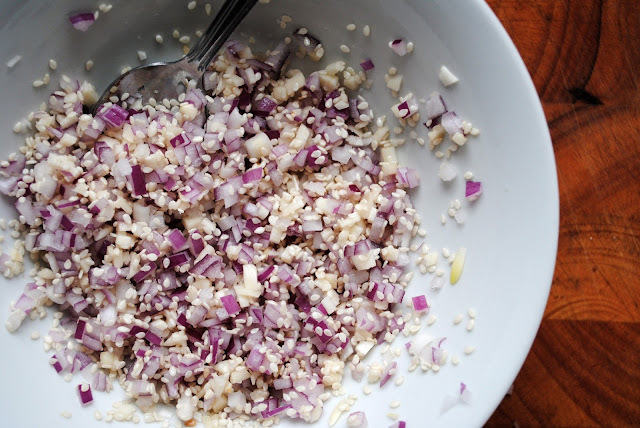 Sesame seeds, sea salt, dried onion and garlic scattered across the top. Perfect. Once the dough has proved for at least an hour it should have doubled in size. Punch it down and leave it for another quarter of an hour. Tear into eight evenly sized pieces, roll into balls and with a floury finger push a hole through the centre of each one. Use a chopstick or your finger and spin the bagel round to stretch the centre hole until it's about the size of a 10p piece (or a quarter for my friends across the pond). Cover with a damp tea towel for another ten minutes. Bring a large pan of water to the boil and then reduce to a simmer. Drop the bagels in one at a time and wait until they float to the surface. Once they're floating set your timer for two minutes, then flip and do two minutes on the other side. This will give you that incredible New York style chewy bagel..the kind that you unfortunately just can't find anywhere over here in the Queen's England. Use a slotted spoon to pull the bagels out and drop them on a baking tray. Pat them dry with some kitchen roll and then spoon over your topping. Anything can go here - a bit of brown sugar, pumpkin seeds..anything that can take a bit of heat. Bake at 220C for 20 minutes or until they're golden brown. Slice open and serve with your favourite cream cheese. Butter, by the way, is not cool. If you put butter on your bagels we cannot be friends. Yum homemade bagels! So impressive.